Automatic replies set up by UConn faculty and staff in Office 365 are not received by students in their UConn Gmail accounts. Automatic Replies is a setting in Microsoft Outlook that enables the account owners to create an automatic response to incoming messages. This setting is frequently used for out-of-office messages. Students have an Office 365 mailbox, even though their official university email account is on G Suite. Their Office 365 account typically forwards data to their G Suite accounts, but automatic replies are an exception and not forwarded. As a workaround, faculty and staff can create a rule in Outlook so that automatic replies are delivered to students’ Gmail accounts. Open Outlook. Click the Home tab at the top of the screen. Click Rules in the top ribbon, and then select Manage Rules & Alerts from the dropdown menu. 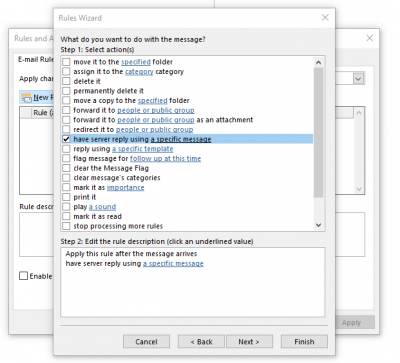 Click New Rule…, and select Apply rule on messages I receive. Click Next. Ensure that none of the conditions are checked. Click Next and then click Yes in the popup box. Check the box by have server reply using a specific message. In the untitled message that pops up, type your automatic reply (out-of-office message). You do not need to enter anything in the To… or Cc… fields. Click Save & Close in the top ribbon when finished. In the Rules Wizard menu, click Next and then Next again to pass through the next screen and finally Finish. In the Rules and Alerts screen, click OK. In the top box, select the rule you wish to turn off. Either uncheck the box by the rule if you wish to use it again but turn it off, or leave the box checked and click Delete if you wish to completely remove the rule. This entry was posted in 365 Support, Troubleshooting.